Whether the smartphone of the future will project onto our forearms or bend around our wrists is still unclear. But there is one thing that many tech companies seem to be betting on: It won't look the same as the rectangular devices in our pockets today. As The Verge reports, consumers looking for something a little different can now preorder a smart pocket watch whose major selling point is its circular shape. The Berkeley, California-based company Monohm debuted their round smart device concept at the Mobile World Congress in 2015. After spending a year bumping into technical issues while designing it, the Runcible is finally available through Indiegogo. Monohm isn't marketing the device toward people who already love their iPhones. It's being billed as the "anti-smartphone" and the distinctions go deeper than its unusual appearance. Instead of lighting up your screen with notifications multiple times a day, Runcible "distills your digital life for you in clean, quiet, glanceable ways." Its map application suggests scenic routes for users who aren't looking to get from point A to point B as quickly as possible—a major diversion from most devices we see on the market today. Perhaps its most noteworthy feature is the open source software. Monohm admits that the device isn't yet as polished as other commercial smartphones, but they're inviting consumers to tinker with it and see what they can improve. 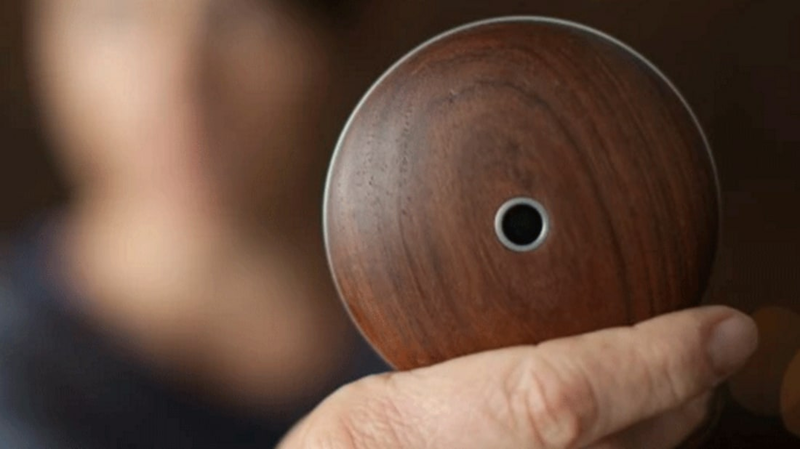 The compact-mirror-sized gadget is seeking funding through June 30. The $399 version comes with a back made from recycled ocean plastic, and for a $499 pledge donors can reserve the "Lovelace" model made from wood harvested from Mendocino County, California. Shipping is estimated for September of this year.